High elevation big mountain ski resorts in the West keep spinning lifts and grooming snow long after most skiers and snowboarders are interested in playing winter sports. 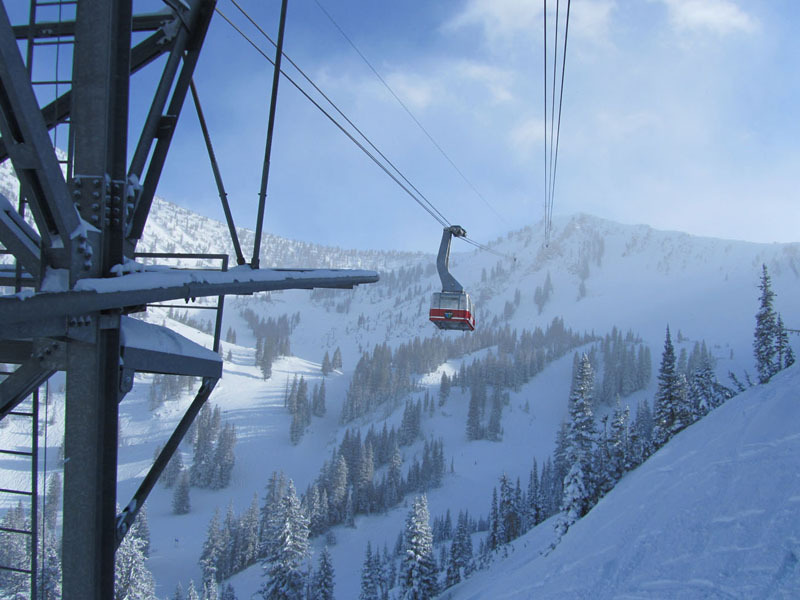 But we highly recommend spring skiing at these ski resorts in Colorado, Utah, California and Oregon. The lodging deals are great, skiing is a steal – even free when you buy next season’s pass, the sun is out, the snow is soft, and there is a fraction of skiers on the slopes. Mammoth California receives plentiful snow all winter, and come spring, things soften up and the California crowds disappear. Mammoth keeps skiing until July 4th some years. Snowbird, Utah gets over 500-inches a season, and soars to 11,000′ on Hidden Peak, affording them long lasting conditions, often well into May, and great lodging deals at the luxurious Cliff Lodge as the skier visits dwindle. Arapahoe Basin has super high elevation, Coloradoans call it ABasin and its the King of Spring. The Pallivacini is a spring ski must. Arapahoe Basin’s season is over 233 days long, often starting in October and staying open well into June. Tailgate parties in the slopeside parking lot make Arapahoe an annual spring ski rite of passage. 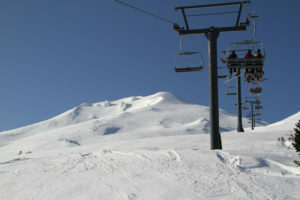 Mt Bachelor in Oregon has 9,065′ in elevation and above tree line skiing that good late season, generally into mid-May. Bachelor makes a great spring ski trip. Kids will love skiing on a volcano, and hiking and biking the same day in warm sunny Bend. Vail Colorado becomes party central in April, after the tourists have left, you get the Back Bowls to yourself, and every evening in Vail village is a spring celebration – Spring Back to Vail with concerts, and a beach atmosphere in Vail Village – that’s family friendly – so are the lodging rates this late. Lake Tahoe’s Squaw and Alpine Meadows generally stay open until mid-May. You have California sunshine, Lake Tahoe views and tons of terrain. Each season may be longer or shorter based upon snow accumulation in Lake Tahoe for the season. Timberline Mount Hood in Oregon is where the US Ski Team trains in June and July, so there’s plenty of snow on this gorgeous glacier for a summer ski fix. Lodging at the Timberline Lodge is ultra convenient and historical. Winter season at Mount Hood goes until Memorial Day Weekend. 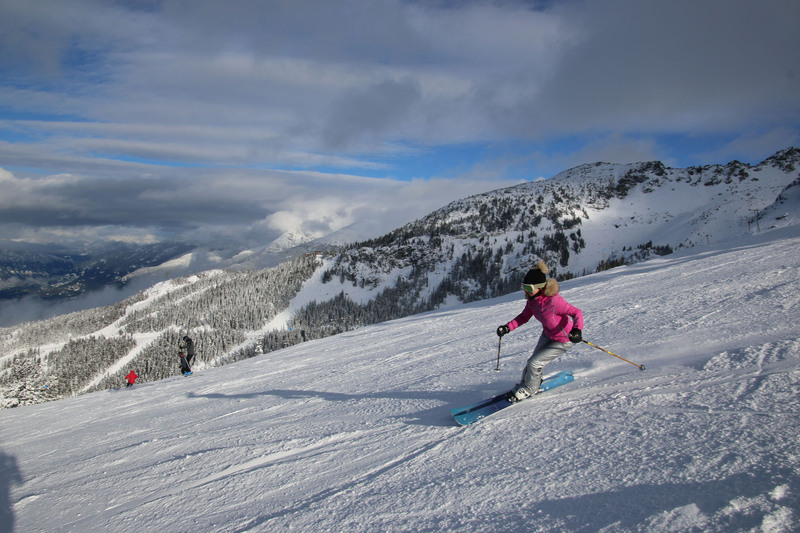 Whistler and Blackcomb are high elevation, and the ski scene keeps rolling here through April with festivals, parties and plenty of skiing and riding, particularly on the Blackcomb glacier. Sunshine snow years can vary so Ski Sunshine at Banff can remain open until mid-May some years and close the third week in April others, with a summit elevation of 8,954′ and a big 3,500 vertical. The Sunshine gondola whisks you to the on mountain base of Sunshine Village at 7,000′ and the Sunshine Mountain Lodge where the snow lasts into May on good snow years. And Banff down the valley is a beautiful ski town in any season with nearby Lake Louise Ski Resort as well. Late Season Operations Note: Many of these resorts have full facility and winter operations (most lifts running, base lodges open until mid to late April). They will often stay open several weeks longer with limited lifts (maybe one summit lift) and limited base lodge operations. Best to call ahead, or check the ski resort website for their operation status, and check the forecast, before you pack up to go skiing.